End Caps for mopstick wall mounted handrails. 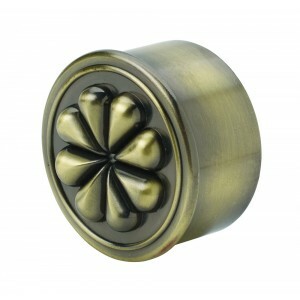 These end caps have a stylish antique brass finish and compliment the antique brass brackets. Antique Brass finish is typically a medium brownish yellow colour, like that of brass, often with golden undertones. It differs from a natural brass finish as it appears worn and is darker, it also absorbs more light than it reflects. It’s typically used on decorative household items. One of the greatest things about this antique brass finish is that is much easier to mix and match with items in other finishes and styles.